The main purpose of the book is to present an overall picture of the astonishing biodiversity among temperate conifers in their natural habitats to a wide audience as accurately and accessibly as possible. Thus the book is not a technical treatise or new botanical treatment of the subject with newly proposed name changes. As the focus is on conifers in their natural habitats, see page samples below, the main principle behind their ordering is their natural distribution; thus, they are arranged alphabetically in 4 regional chapters rather than alphabetically overall. 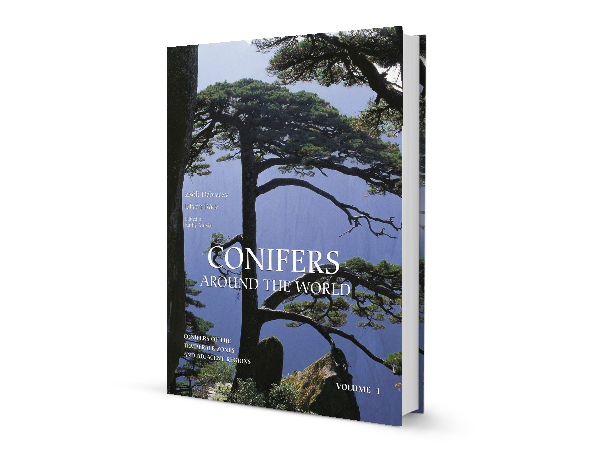 Europe has been discussed “in the broad floristical sense” with North Africa; Anatolia and the adjacent parts of the The largest and most populous continent is also home to the largest portion of temperate-zone conifers. Of the 253 native conifer taxa in 35 genera in the vast land of mainland Asia, around 218 taxa (171 species) in 31 genera occur within the Holarctic world and are considered temperate. (Though part of Asia, Japan and the adjacent islands, as well as Taiwan, are discussed separately in this work.) The “Continental Asia” chapter includes 140 range maps, 39 conifer habitat photos and descriptions, and 157 full-page species profiles (see samples below). Japan consists of 4 large and more than 3000 small islands, with the ~58 conifer species and varieties playing a major role in their flora and vegetation. For reasons of both vegetation history and zonal confluence the conifers of Sakhalin and the Kuril Islands are included in this chapter. There are 34 range maps, 12 conifer habitat photos and descriptions, and 39 full-page species profiles (see sample pages below).